Every time I ride a scooter like this new Suzuki Skydrive Sport, I can’t help but wonder why people still bother taking slow, often crowded, and unpredictable public transportation. I mean, it’s so easy to ride; anyone who can ride a bicycle can easily ride it, too. Well, almost. You still need to get a driver’s license with a restriction 1 on it to operate a motor vehicle legally. But I’m sure you get my drift. Scooters come in many different sizes, but it’s the smallest ones that offer the biggest in terms of ease of use and practicality. Their compact size and small displacement engines allow you to zip from point A to point B in the least amount of time and fuel. Suzuki’s new kid on the block is one such wonder. 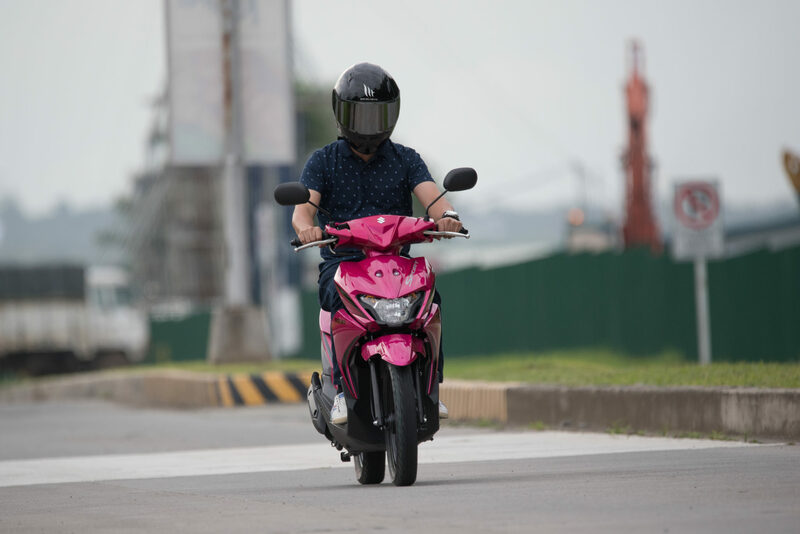 A few weeks before its official launch, we were invited by Suzuki Philippines Inc. to test ride their latest scooter offering at their office in Canlubang, Laguna. Upon seeing the Skydrive Sport for the very first time, I immediately knew Suzuki had a winner in their hands. 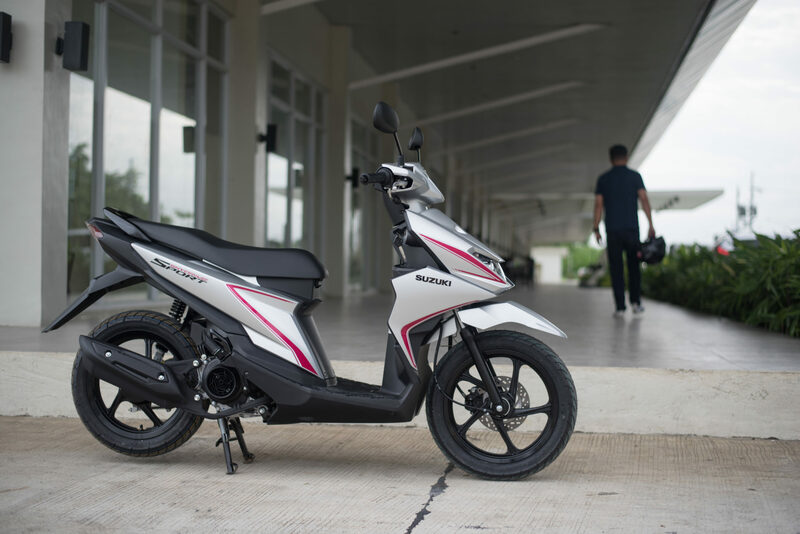 In the highly contested entry-level scooter segment, styling plays a very important role to attract fashion conscious young buyers, and the Skydrive Sport certainly delivers in this area. 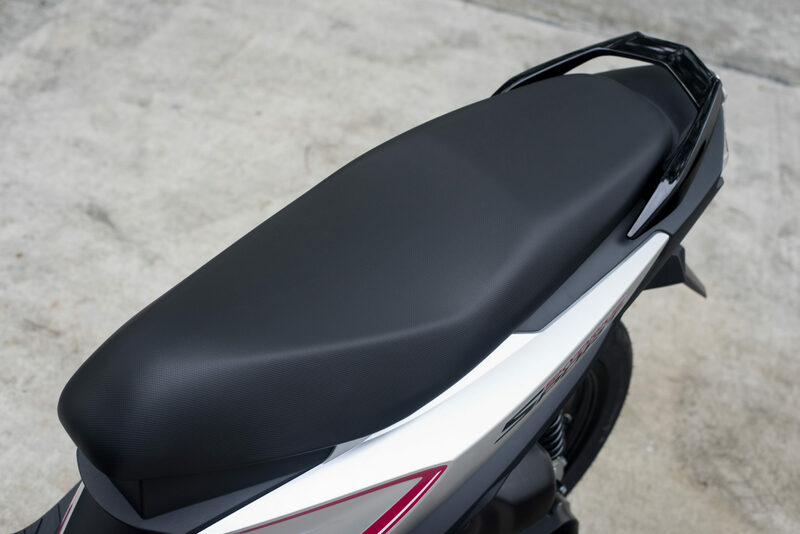 Despite its compact dimensions, Suzuki was able to incorporate plenty of simple yet interesting crisp edges to create a sporty yet subtly elegant appearance. Three colors are available to cater to different tastes: black, magenta, and silver. Three colors are available to cater to different tastes: black, magenta, and silver. 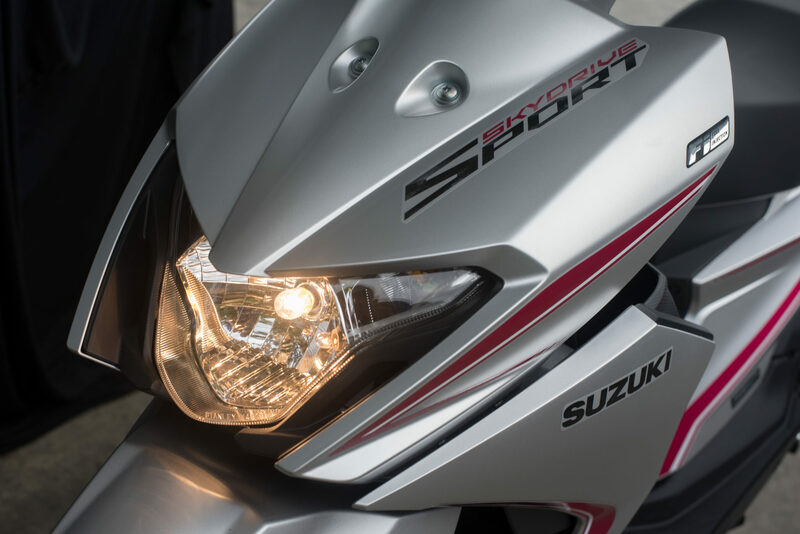 Unlike the original, and utterly popular, Skydrive 125 (still being offered by Suzuki but with new fuel-injection) that has a very distinctive dual headlights setup, the Skydrive Sport makes do with a large, and slightly recessed, single headlight. I must say, its shape kinda reminds me of the headlight of the Suzuki GSX-R 750 and somehow gives the Skydrive Sport its unique identity. The upswept tail section also gives the Skydrive Sport a sporty, ready to pounce, stance. A flat floorboard allows easy access from both sides, and it can also function as a carrier for a grocery bag or two. Its overall styling, I believe, would appeal more to male riders aspiring to be different from a sea of similar looking scooters in the market. 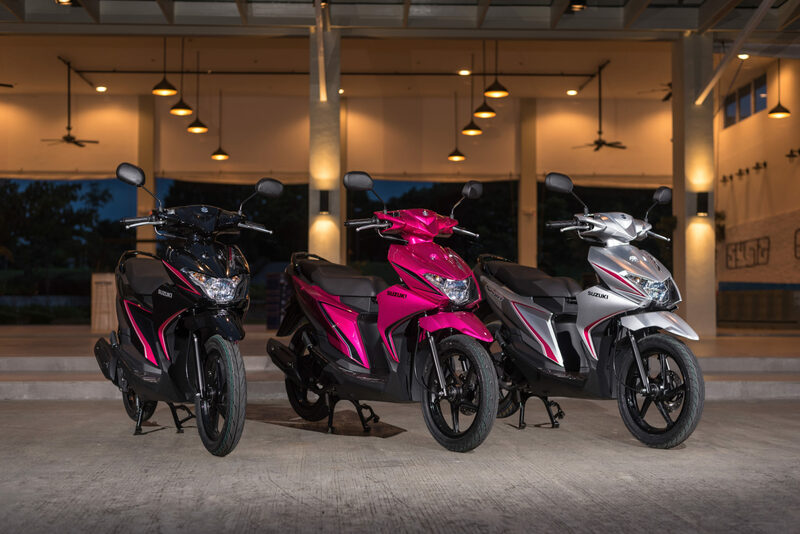 In size and appearance, it’s quite obvious that Suzuki has the Honda Beat and Yamaha Mio Sporty in its crosshairs. 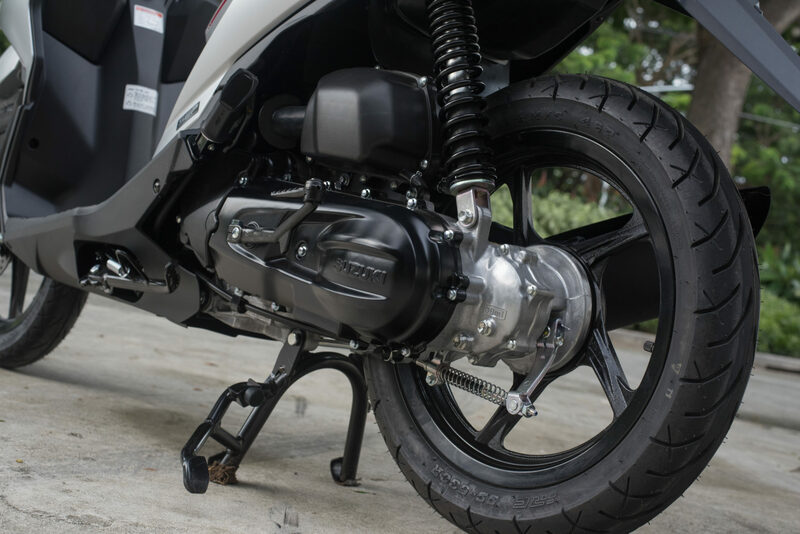 The Skydrive Sport is powered by an 113cc 2-valve, air-cooled, single cylinder, fuel-injected motor that produces a perky 8.98 hp and 6.27 lb-ft of torque that should be on par with its rivals from Honda and Yamaha. Power is transferred to the rear wheel via a CVT and acceleration from a full stop is smooth and responsive. Unlike its rivals, Suzuki didn’t bother putting any idling-stop function to enhance fuel efficiency. Instead, Suzuki incorporated SEP, or Suzuki Eco Performance in its engine design. SEP promises low fuel consumption without affecting performance by optimizing the cooling system, reduction of friction, improvement of combustion, lightweight, and high compression ratio. We will conduct our own fuel efficiency test once we get a hold of a long-term test unit. With just 93 kg. curb weight to carry around (minus rider), the Skydrive Sport’s handling is light and agile, which is good to minimize rider fatigue when navigating in our traffic congested roads. 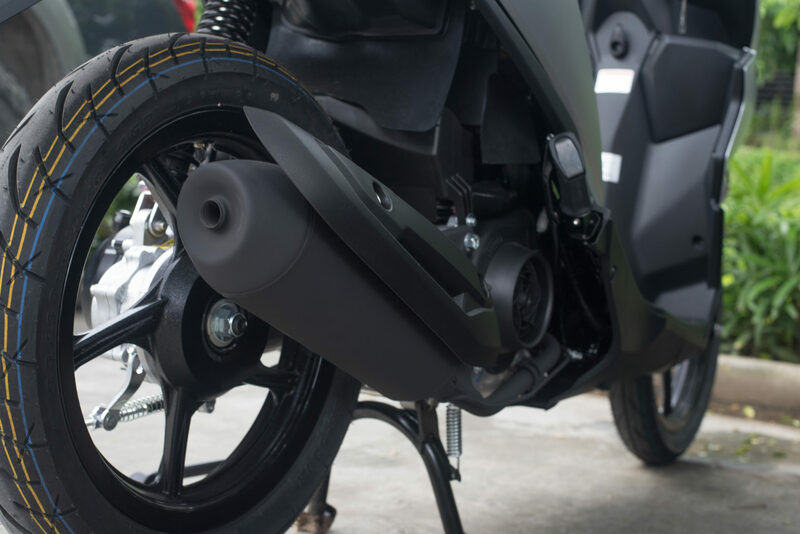 As with most scooters, don’t expect any adjustments for the front telescopic forks, and only spring preload for the single shock absorber at the back. But the spring rates and damping characteristics are generally comfortable for all around urban commuting for two. The Skydrive Sport rolls on 14-inch tires front and rear. While the rims are ideal for tubeless tires, the Skydrive Sport comes with tube type IRC rubbers. They provide plenty of grip, though. 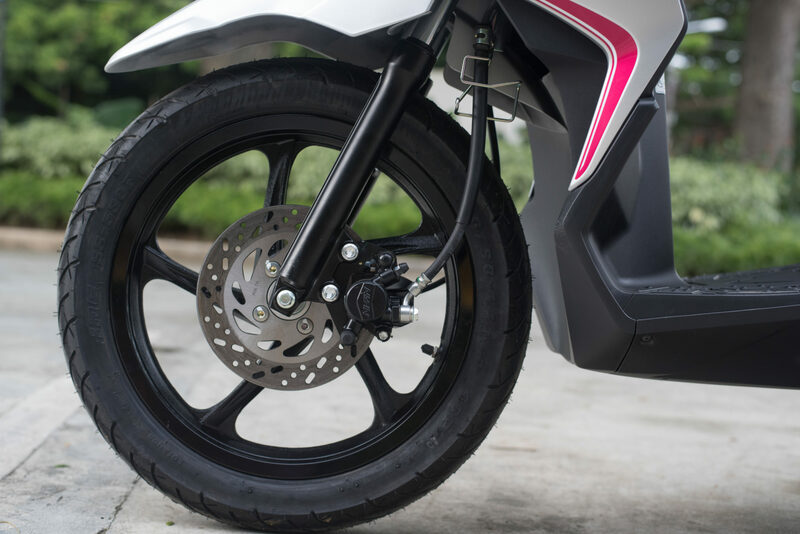 Braking duties are handled by a front disc with a single pot Nissin caliper and a rear drum brake setup. Both are easy to modulate and independently provide plenty of stopping power. No combi-brakes or ABS available. The Skydrive Sport’s low 740 mm seat height should suit most riders, even those taller than my 5 ‘7 in height. 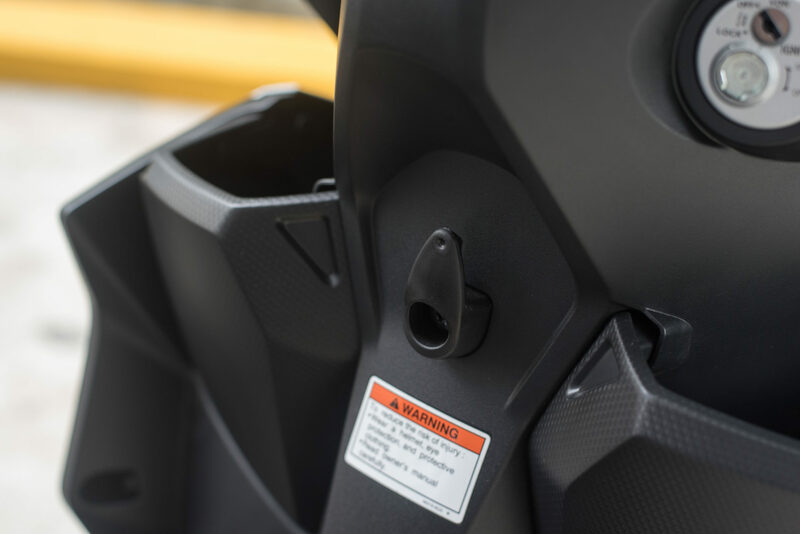 Pillion riders get fold-able rubber covered foot pegs and a sturdy grab handle. Riding position feels natural with easy reach to the handlebars. Switches are laid out intuitively and within easy reach of the rider’s hands even without looking. 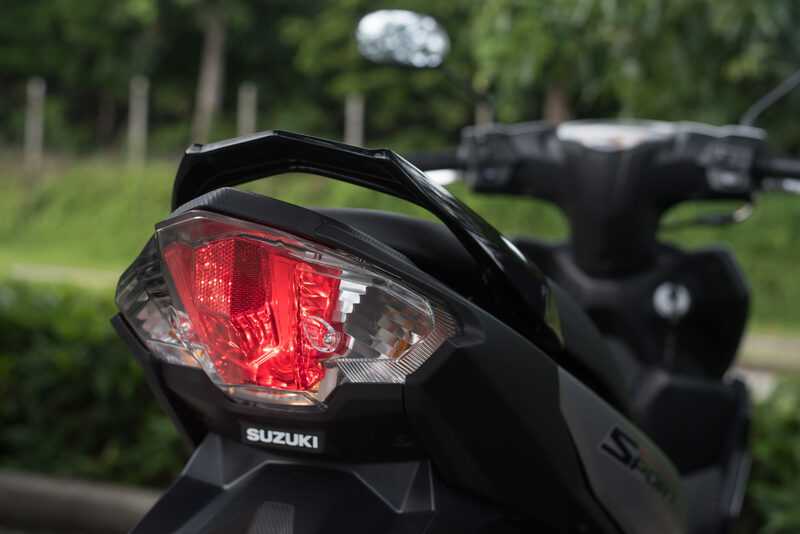 Speaking of switches, at a time when most scooters in this category already has an automatic headlight on feature, the Skydrive Sport is still equipped with a manual headlight switch which some might find annoying. At least it has a park light, and having the ability to switch off the headlight has its benefits in certain situations. 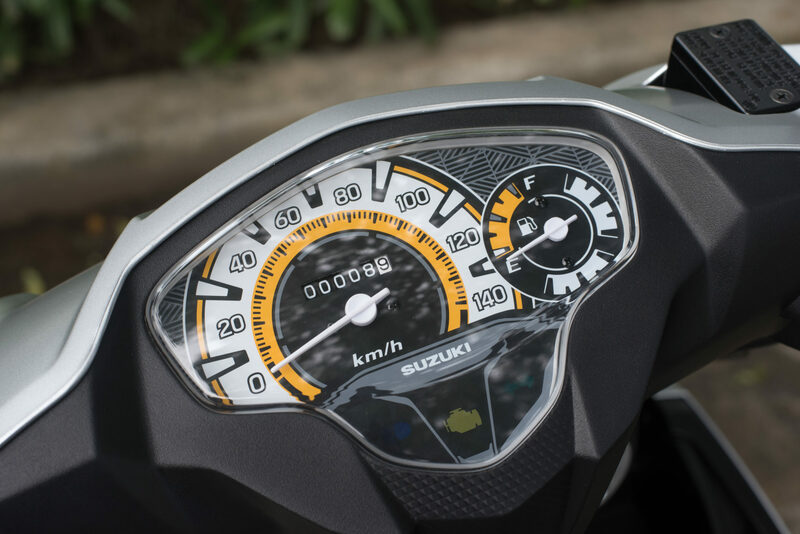 The instrument console is composed of a large speedometer, a fuel gauge, and an odometer that’s easy to read during day or nighttime riding. 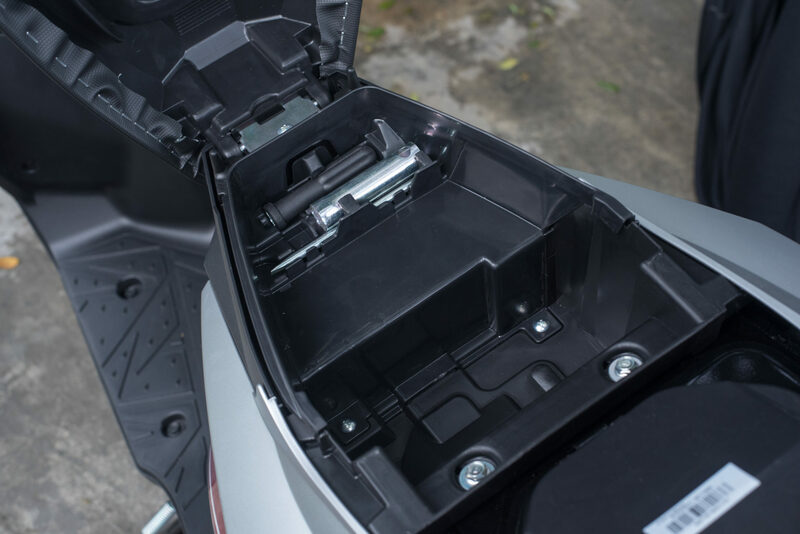 For convenience, there’s a small compartment under the seat for some personal items and some tools. As with other Suzuki products, overall build quality is topnotch and should last a very long time with proper care. 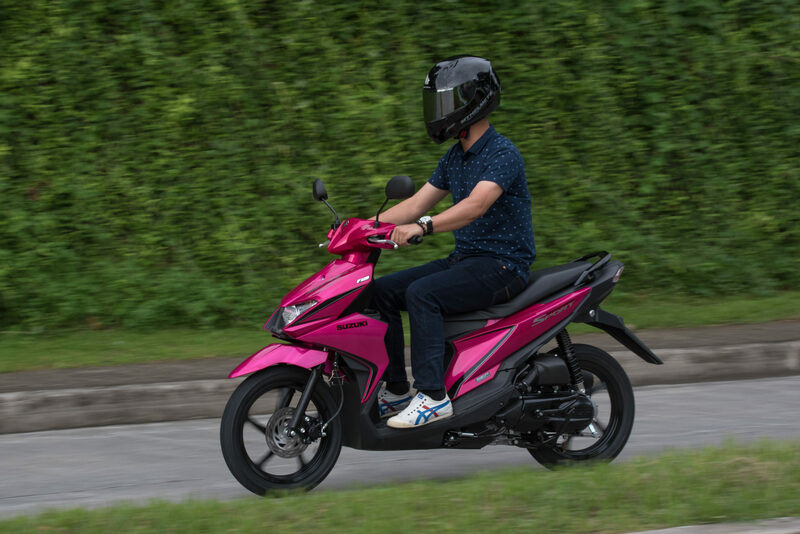 The Skydrive Sport is a welcome addition to Suzuki’s current scooter lineup and should suit a variety of riders; from newbies to experienced riders who want to set the trend and those who want to standout from the crowd. Price as of this posting is PhP 67,900.00 and should make it competitive against the standard Honda Beat 110 (PhP 64,900.00) and all-new Yamaha Mio Sporty (PhP 67,900.00).